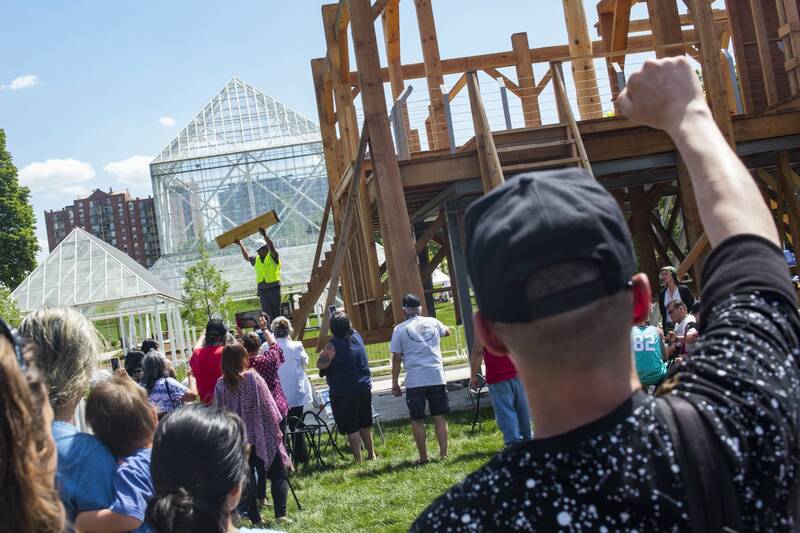 About 300 people on Friday witnessed the start of the demolition of the controversial "Scaffold" sculpture at the Minneapolis Sculpture Garden. The piece had drawn wide condemnation because it includes elements copied from the gallows used in the mass hanging of 38 Dakota men at Mankato, Minn., in 1862. "Scaffold" was to have been one of the prominent new pieces in the Sculpture Garden, which has recently been renovated and expanded. The decision to dismantle the structure and burn its pieces was reached after days of negotiation among Dakota elders, the Walker Art Center, the Minneapolis Park Board and the artist Sam Durant. Friday's event began in a nearby parking lot where the crowd heard from a number of speakers, including Dakota elder Sheldon Wolfchild. He described the sculpture as negative energy, and explained that Dakota teaching says people need to replace such forces with positivity. "We work as elders first for our children and the future generations," he said. "That is our responsibility, in a beautiful, good way. And when we take this down, then our children will not have to see this image again." Everyone then moved closer to the sculpture, which is imposingly huge. It was designed as a commentary on the history of U.S. capital punishment, and includes elements from seven historic executions. However, the element that stands out painfully to the Dakota and many other local people is the reference to the 1862 mass hanging in Mankato. A spiritual ceremony was designed to cleanse the area, and to protect the demolition crew from harm. Tribal members walked through the crowd burning sage as part of the cleansing. People were also offered tobacco from a large bowl, asked to pray over it, and then return the tobacco to the bowl. 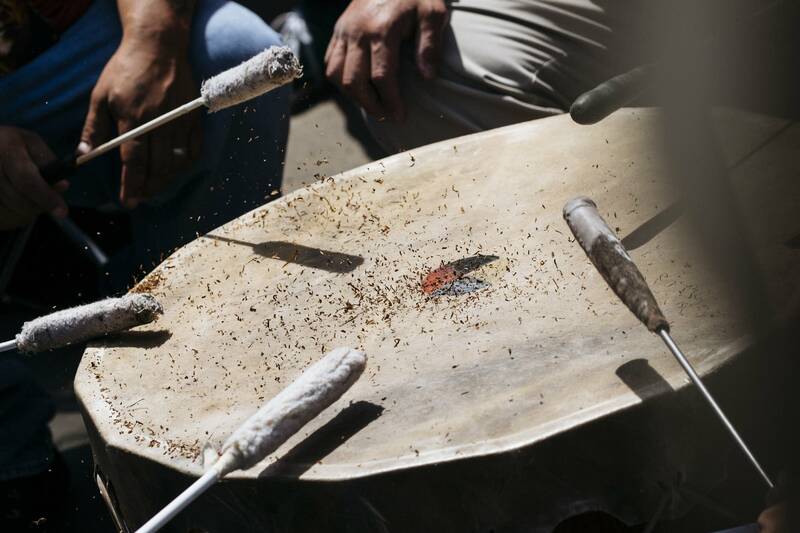 Dakota spiritual leader Art Owen said the tobacco would travel Friday night to the Dakota sacred site of Bear Butte, where it will be left as an offering. 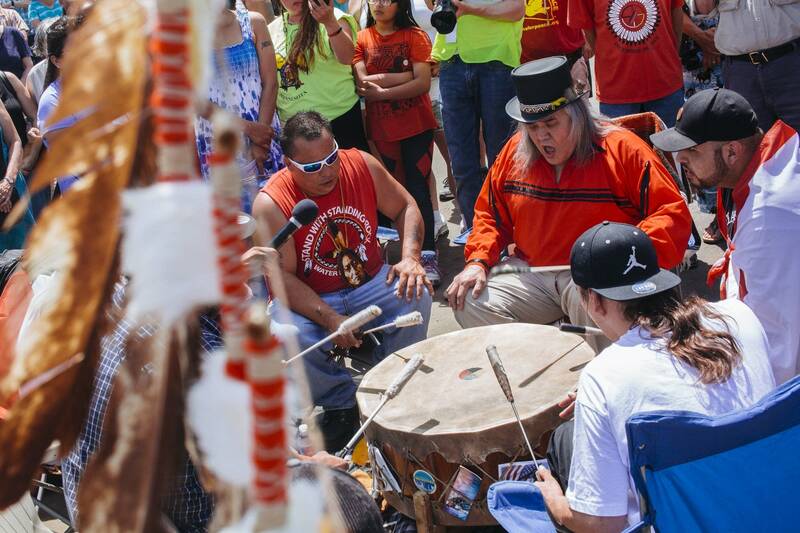 The ceremony included prayers and songs in Dakota, including the traditional Four Directions song. Many in the crowd joined to turn together. Finally, the crew began removing the first wood as the crowd watched. The removed wood was placed in a symbolic fire pile nearby. It will be burned at Fort Snelling, on a date not yet determined. In Friday's ceremonial start, workers removed only a few planks. The real work will begin Saturday. The wood's removal is expected to take about four days; then workers will remove the steel and concrete parts of the structure. Everything will be gone in time for the reopening of the Sculpture Garden on Saturday, June 10.